The cement stretched for acres around us, cracked and neglected, weeds springing up every few feet through the cracks. It reminded me of a scene from some post-apocalyptic science fiction movie, or from Alan Weisman’s fascinating book The World Without Us, in which he extrapolates what would happen to the planet if humans were to suddenly vanish. But it wasn’t anything quite so dramatic. We were crossing an abandoned runway at the former Alameda Naval Air Station. And we were riding in, of all things, an old-fashioned yellow school bus – on the annual Return of the Terns tour. 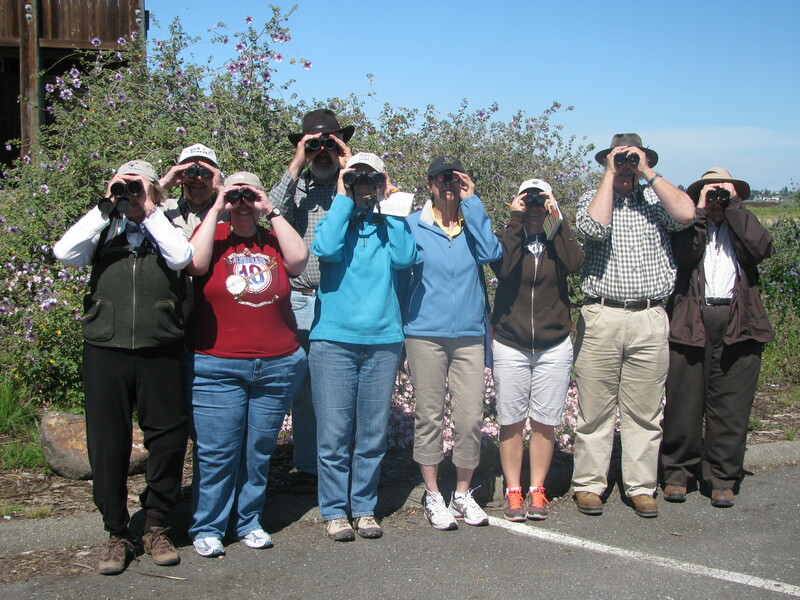 Each June, the East Bay Regional Park District joins with other groups including Golden Gate Audubon Society to host bus tours of the breeding colony of endangered California Least Terns at the old Alameda naval air station. The area is normally closed to the public to prevent disruption of the tern nests. But on Saturday, we were able to drive within yards of the tern colony, provided we didn’t get off the bus or make loud noises. This may be one of the most unusual birding sites in the world. Forget images of birding in leafy groves or reedy marshes. Least Terns traditionally nest on flat strips of sand or gravel — wide-open surfaces that seem frighteningly vulnerable but give them a good view of potential predators. Decades ago, the terns apparently decided that the airstrip’s tarmac would be a good substitute for their vanishing beaches. 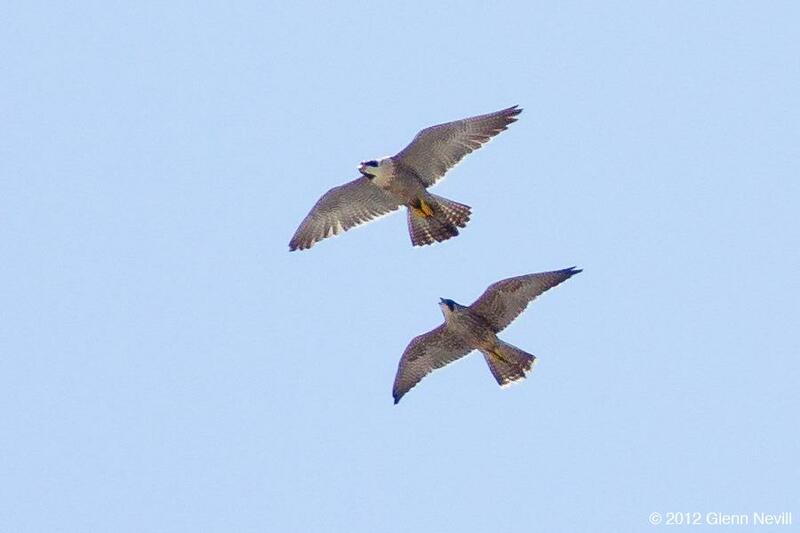 They started returning and nesting here each spring despite the constant takeoffs and landings. 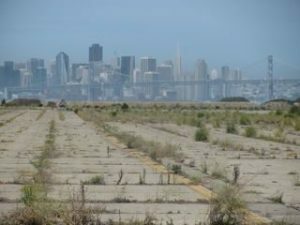 Then we reached the tern colony — a ten-acre section of tarmac enclosed with wire fencing to keep out stray dogs, cats and humans, covered with a layer of sand imported from Angel Island, and dotted with shells and small structures provided by volunteers to shelter the tern chicks. 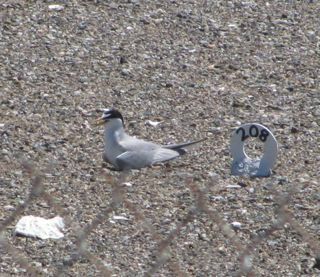 The area also held a number of small white markers with numbers, used by volunteers to map and track nests from a distance. Peering out the windows like schoolkids on a field trip, we saw and heard dozens of terns swooping through the air — males bringing fish to their chicks or mates. We could see females sitting on nests, which are little more than indentations in the sand. 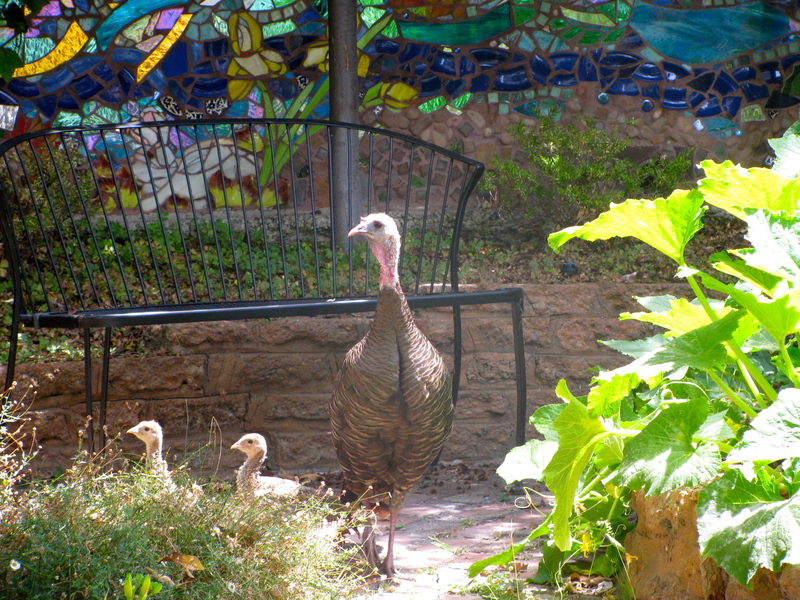 And every so often we glimpsed a fuzzy gray chick peeking out from under its mother or hiding from the sun in a section of conveniently-placed terra cotta pipe. It was a hot day, hotter than is comfortable for the chicks, who don’t have the same body-temperature control mechanisms as adults. The terns face a variety of challenges to their survival — man-made challenges such as loss of habitat to development, along with traditional challenges such as predators (raptors, ravens etc. ), food supply and weather. 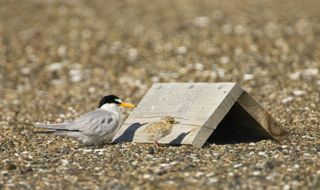 With some 300-350 nesting pairs, Alameda Point is the most productive breeding colony of Least Terns on the West Coast. But even so, 10 to 20 percent of the chicks don’t make it to adulthood. Statewide, the number of California Least Tern nesting attempts has fallen from 8,173 in 2006 to 6,404 in 2011, according to the U.S. Fish & Wildlife Service. The number of fledglings fell even more starkly, from 3.108 in 2006 to 1,106 last year. These declines make the Alameda site — as unlikely and science-fiction-like as it seems — more important than ever. 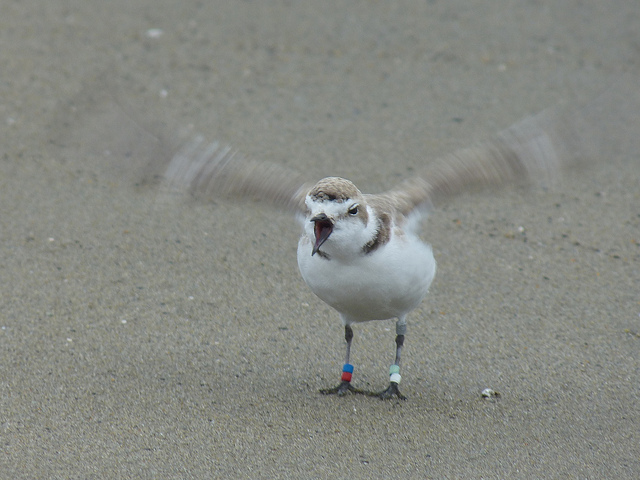 About 17 percent of all the fledglings on the West Coast come from Alameda Point. After about 40 minutes of watching the birds, we headed back to Crab Cove Visitor Center to let the next group have a turn on the bus. Outside the center, volunteers with Friends of the Alameda Wildlife Refuge were staffing an information table. As a relative newcomer to GGAS, this was my first visit to the tern colony. But the FAWR/GGAS volunteers have been visiting for decades, both before and after closure of the naval base — monitoring the nests, documenting the incidence of predators, and enhancing and fencing the site while the terns are wintering in Central or South America. They’ve seen night skies bright with constellations over the tarmac. They’ve seen rainbows that end at Alameda Point. They’ve also been determined advocates in a long-running battle to create an official wildlife reserve at Alameda Point, and to fend off development proposals that would threaten the terns. My own takeaway from Return of the Terns was how resilient these creatures are. They’re so small — about as long as an Aidell’s sausage, and hardly thicker. Faced with the loss of their traditional breeding habitats, they found a new one under the noses of military jets. 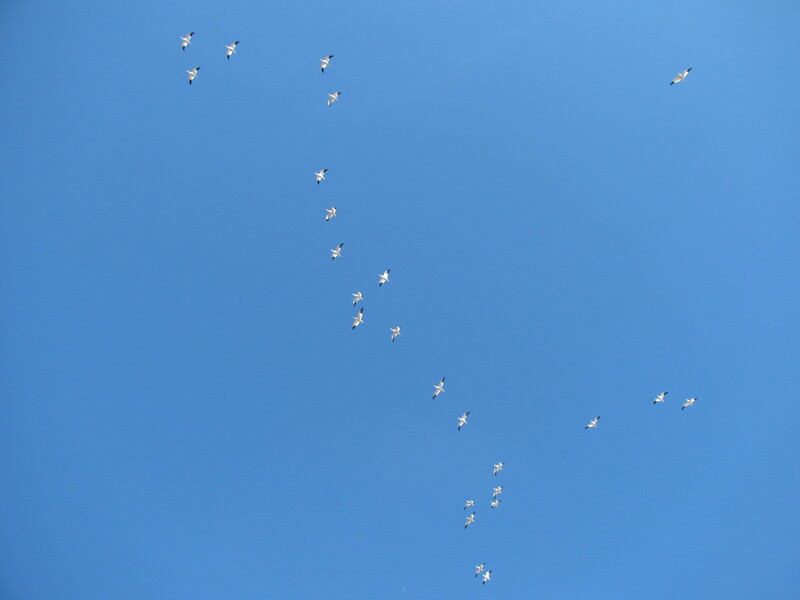 The Alameda terns are visible evidence of how wildlife can coexist with us, even in the most urban settings. But then you look at that view of San Francisco from the airport tarmac, and you understand why developers have been itching to get their hands on Alameda Point for years. Or you think about climate change, and wonder what will happen to future generations of tern chicks if hot sunny days like Saturday become a norm. The terns are resilient — but only if we give them a chance. Want to help support the Alameda tern colony and create a permanent wildlife refuge at Alameda Point? Get involved with Friends of the Alameda Wildlife Refuge; one woman on my bus said that a FAWR work day helping safeguard the nest area was one of the most fulfilling days she’d ever spent in her life! Or donate to GGAS/FAWR. You can earmark your gift to support our advocacy work on behalf of the terns. For a few weeks I’d been hearing about the famous Berkeley owls of Claremont Canyon. A pair of Great Horned Owls had built a nest right along a popular hiking trail about two minutes from the Claremont Hotel, and were raising one or two chicks. They had become avian celebrities, delighting hikers and dog-walkers even as they would swoop down at passing dogs whom they perceived as a threat to their young. On Sunday morning, Sam and I headed over to take a look. We joined the little crowd of paparazzi ogling and photographing the nest. It was in a eucalyptus right next to the trail, and a chick was easily visible even without binoculars. It took a while to spot the mother owl, who was keeping watch from a tree about twenty yards away, but we eventually found her too. “Didn’t the owl in Winnie the Pooh have a sign pointing directly to his house? Don’t they all have that?” joked my friend Susie today when I was giving her directions on how to find the nest. It struck me that nearly all of us urban Americans — myself included — are much more familiar with fictional, cartoon or designer owls than we are with real ones. Think about it. Owls are common in children’s books (Sam and the Firefly! Hedwig in Harry Potter! Owl in Winnie the Pooh!) and marketing (from the low-tech owl on those old bags of Wise potato chips to the high-tech, stylized owl logo of Hootsuite). Most of us come up with an image of owls based on these caricatures rather than on the actual bird. 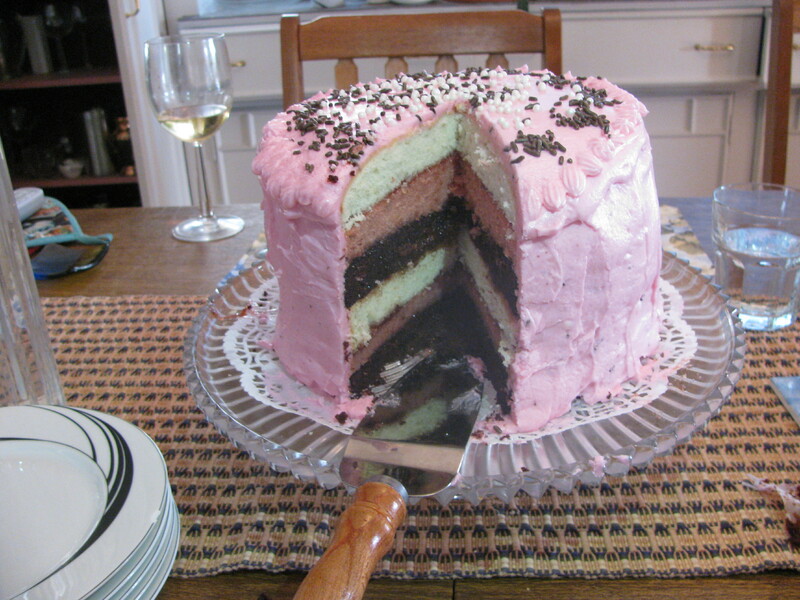 That’s true for a lot of nature — even spilling over into food. I consumed a lot more cherry Life Savers than actual cherries when I was a kid. And Cherry Life Savers taste nothing like actual cherries. In fact, they taste nothing like fruit. Yet if you asked me as a child what “cherry” tasted like, I would have immediately thought of the Life Saver. I still sort of do. Ditto for a bunch of other fruit flavors… pineapple, grape, lemon. Even though a grape Popsicle is a far cry from what an actual vineyard-grown grape tastes like. I know this isn’t the biggest deal in the world. Civilization isn’t going to rise or fall because most American kids have seen more Disney birds and animals than real, living birds and animals. 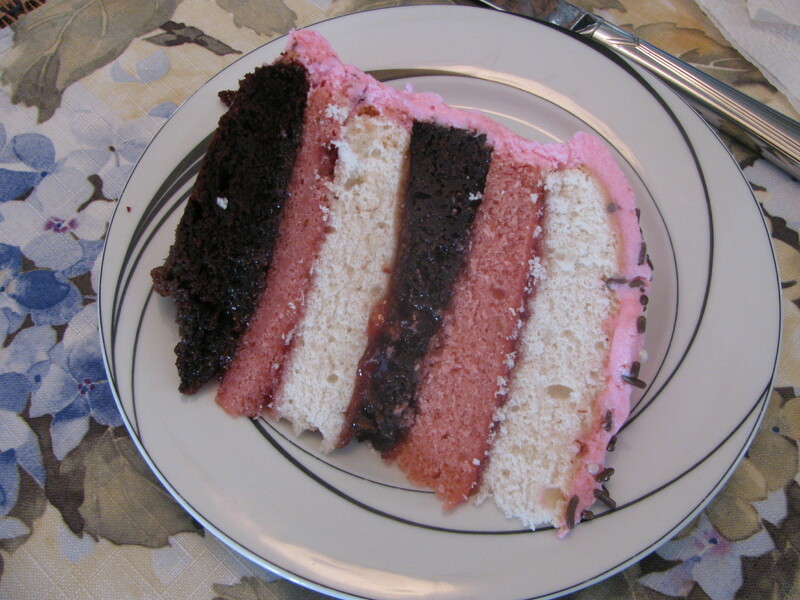 But still, it’s a little unnerving. We all think we “know” animals and birds and plants and the food we eat. While in reality, that “knowledge” has been filtered and mediated and refracted through the pervasive fun-house mirror of mass media and marketing. Peripheral vision. Walking through a wood or a meadow, you’re surrounded by 360 degrees of things to see — clouds, trees, grasses blowing in the wind. In one small corner, a bird flits between branches. A good birder notices the movement. It’s partly peripheral vision, and partly an ability to notice slight changes in a broad panorama. It’s like the “Where’s Waldo” children’s books, where you scan for the tiny figure with the red striped cap in a page that is busy with hundreds of other tiny figures. Pattern recognition. One of the first things a birder notices — in a split-second, without consciously thinking — is the shape of a bird. Is that distant figure on the water shaped like some kind of duck, or some kind of cormorant? Toddlers learn to do this when they sort plastic triangles and squares into triangle- and square-shaped holes. We adults do this every day with images from our urban environment — the hexagonal traffic sign that means “stop,” the triangular one that means “yield.” But I learned the traffic signs decades ago, and I’m only now trying to learn the shapes of birds. Noticing and remembering colors. This is where I frequently get stuck. In distinguishing among similarly-shaped birds, you have to notice all these minute differences in colors. One kind of grebe has black around its eye, while another has white. One kind of gull has pink legs, while another has yellow. Not only do you need to be able to notice these differences, but you need to remember them. And the males and females often have different coloration, as do adults and juveniles. I fear my mental database is not large enough to store all the various kinds of gulls. Can I get an upgrade, please? Deciphering layers of sound. The birders who led our trip today were experts at birding by ear — identifying birds just from their calls, without ever seeing them. This requires a good memory for sounds, and remembering which pattern of tweet or trill belongs to a particular species. But it also requires an ability to isolate the calls from each other. 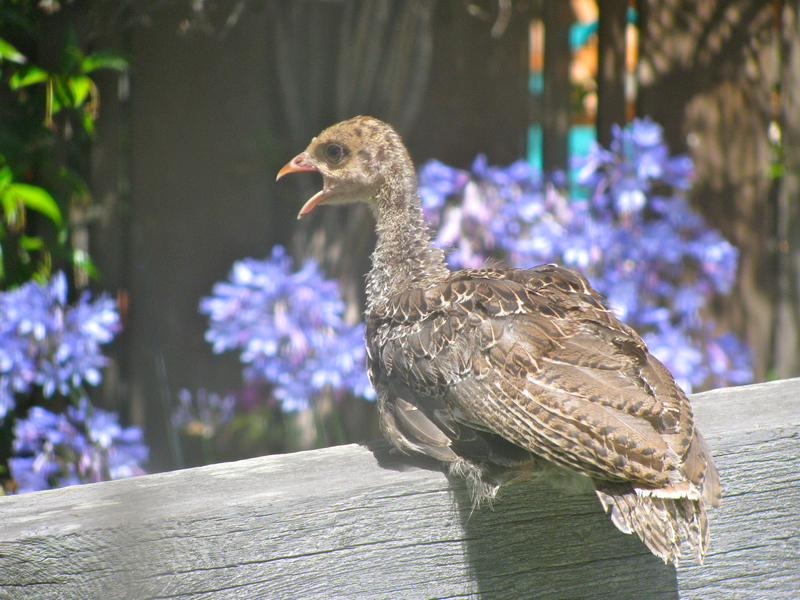 Walking through the Oakland hills today, there were easily six or eight different birds singing at the same moment. At first all you hear is a dense wall of sound. It’s like listening to a symphony orchestra and trying to isolate the viola from all the other instruments. Musicians can do it; people who bird by ear learn to do that too. Attentiveness. This underlies everything else: You have to be mentally present and paying attention. You can’t be birding and texting on your iPhone. You can’t be birding and yakking about the great new restaurant where you had dinner last night. Learning to bird and learning to chant Torah are both mental challenges with no real practical value. They won’t get you a job like learning HTML; they won’t help you go places like learning to drive a stick shift. Basically, you learn them for their own sake. They both involve memorization of a bunch of arbitrary names and words. There is pattern recognition. There is sound recognition. I suspect that both learning to bird and learning to chant Torah challenge our middle-aged brains in similarly healthy ways. It’s like suddenly being a toddler again, forced to learn a language from scratch. They both feel daunting at the beginning. There is no shortcut to repetition: Practice, practice, practice. I return to that famous Anne Lamott line that inspired the title for her great book about writing, Bird by Bird. My own goal is to come away from each birding trip with one new bird that I have seen clearly enough and long enough to be able to remember and identify on my own. If I can add one new bird each time, I’ll eventually know a lot of them. Today my bird was a Fox Sparrow. There were two of them, amazingly close to our trail in the hills, kicking up dirt with their feet like dogs at the beach. That’s apparently a characteristic foraging behavior. They were kicking and rustling leaves and making as much of a ruckus as you can imagine a sparrow making, and they didn’t seem to care a bit that we were about three feet away. That line is a keeper, and worth hauling out in a variety of situations that have nothing to do with woods, trails or birds. Shameless plug: Want to support my Birdathon team and the conservation work of Golden Gate Audubon Society? You can make a tax-deductible online donation here. Today we took our former rabbi on his first birding trip. You know those moments — maybe real, maybe in a dream — when completely unconnected parts of your life suddenly bump into each other? Birds! Judaism! 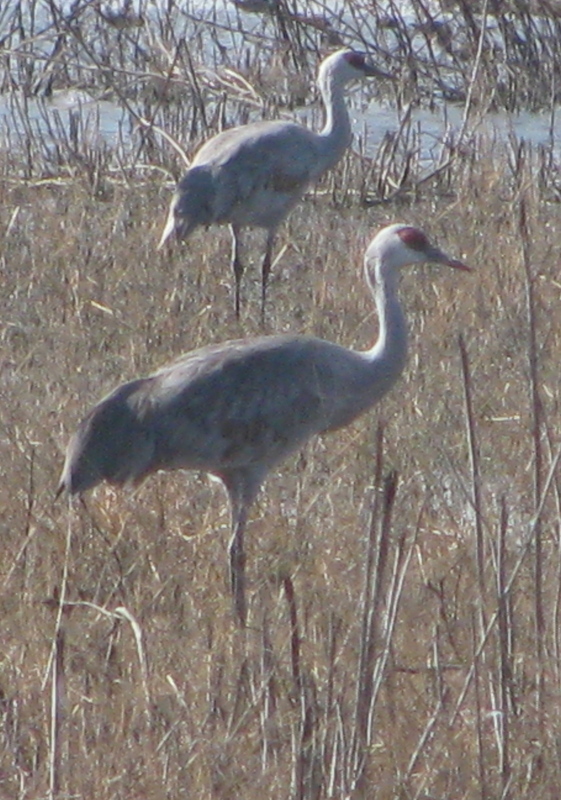 All I needed to fill out the circle was to find a literary agent standing amidst the sandhill cranes. Stranger things have happened. 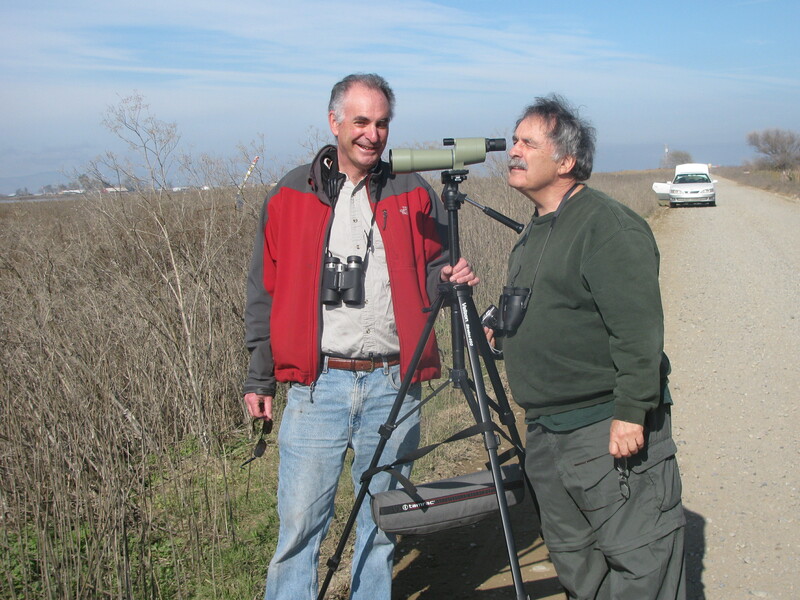 In any case, Sam and I had long planned to introduce Rabbi Steven Chester to birding now that he is basking in the leisurely fields of retirement. 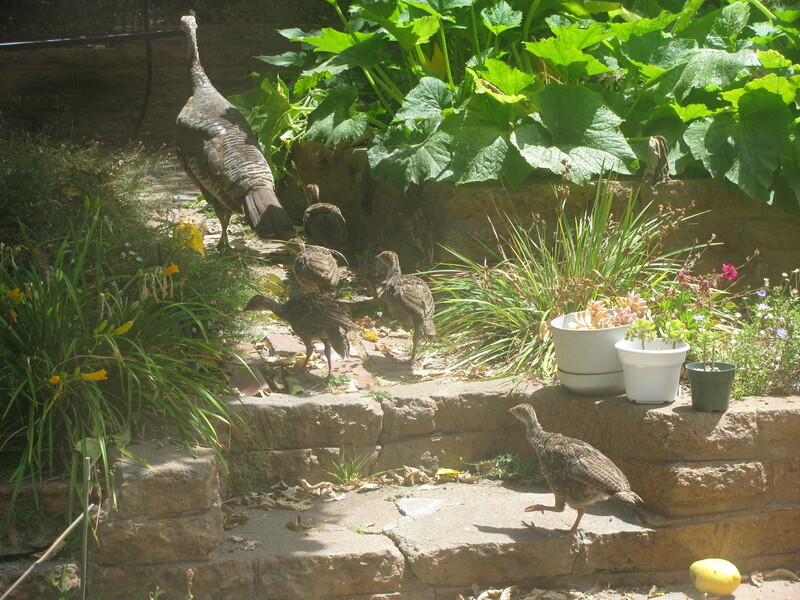 It just happened that the date we picked came two weeks after the start of my new job at… Golden Gate Audubon Society. It was a gorgeous day — sunny, warm, not even a breeze until the mid-afternoon. We’ve been on birding trips in the past where it was so cold and foggy outside that the kids refused to get out of the car to see any birds. Today was the opposite of that. Lots of ducks, including cinnamon teal, which were Rabbi Chester’s favorite. 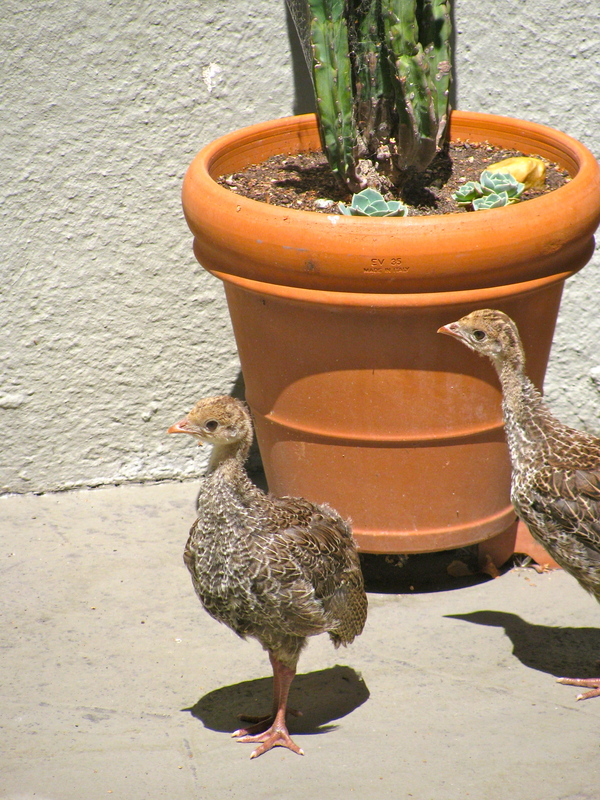 These rich brown birds look like someone dipped them in cocoa or cinnamon. 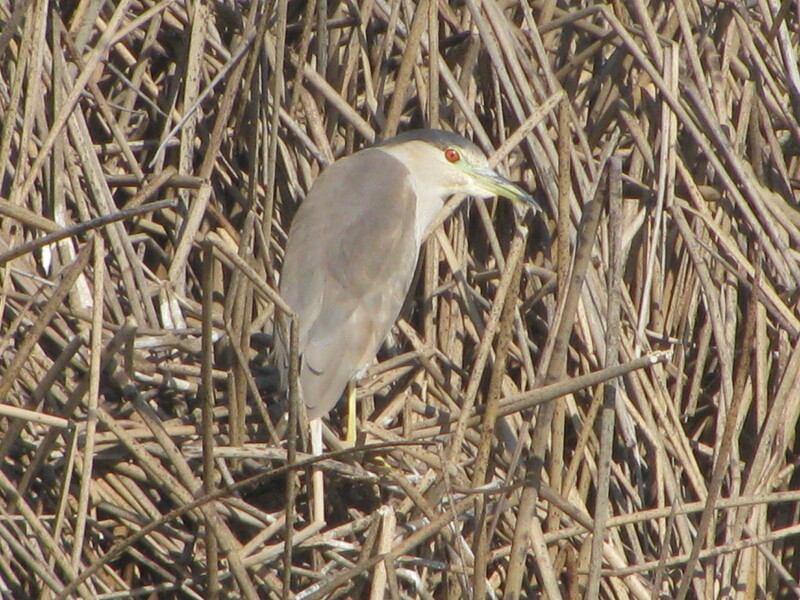 TONS of black-crowned night herons. Now, I’ve seen individual night herons before. But they must have really liked this patch of marsh in Merced National Wildlife Refuge, because there seemed to be another heron every five feet or so. At one point there were nine within our field of vision, perching among the reeds, motionless as gargoyles. Sandhill cranes! 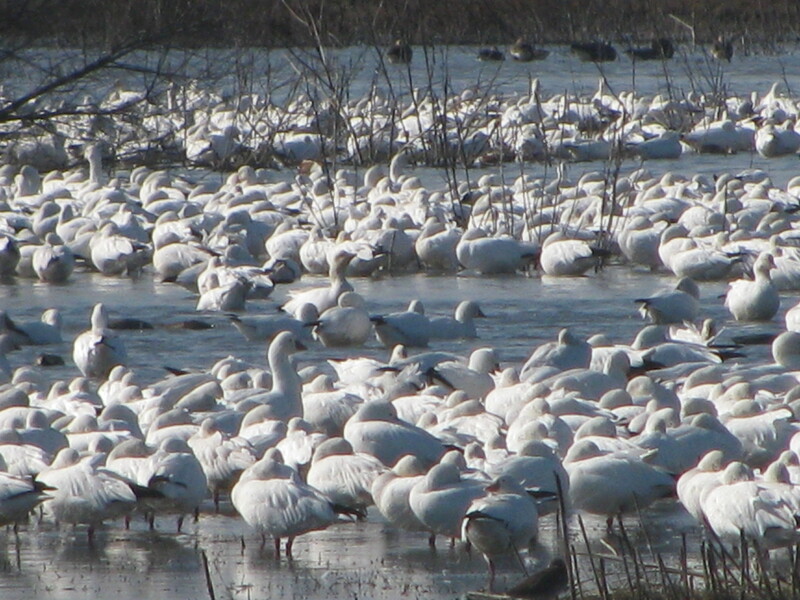 Snow geese! Tundra swans! Giant birds that are 100 percent guaranteed to impress novice birders, or your money back. A bald eagle flying overhead as we ate lunch – wow. And, as we packed ourselves into the car at the end of the day, a flock of snow geese soaring in formation like Blue Angels over our heads. Rabbi Chester had a great day. He brought his point-and-shoot camera, which has an impressive zoom, and practiced wildlife photography for the African safari he and his wife Leona plan to take later this year. Cranes and herons are certainly not as exotic as lions or elephants, but they are a heck of a lot more accessible. So what’s the news behind this blog post? Rabbi Chester: For those of you who know him, I’m happy to report that he’s enjoying retirement. He’s contemplating several writing/photography projects. At Leona’s request, he has joined a group that goes bowling once a week! But he’s also looking forward to returning to Temple Sinai as a congregant once he’s done with his year of staying-away-to-give-space-to-his-successor. Me: With two weeks under my belt, I’m loving my job at Golden Gate Audubon. So far I’ve managed to set off the burglar alarm and program my voicemail greeting as the incoming message for the whole organization. But beyond those little bumps, it’s all good. My colleagues are really talented. The office is funkily nice. My job involves a variety of different tasks, some of which are familiar (press outreach) and some of which involve learning new skills (managing the web site and social media). 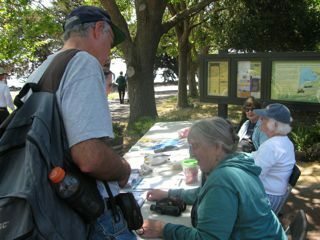 I tagged along on a GGAS birding event for kids at Lake Merritt last Saturday and posted photos on the GGAS Facebook page. You’re welcome to view them here. It wasn’t the Central Valley, but hey — we saw a night heron there too, as well as a lone tufted duck that somehow makes its way to Oakland from Eurasia each winter. 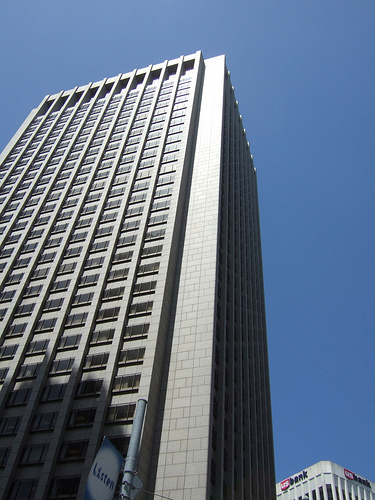 And this was just a ten-minute walk from BART and City Hall. One beauty of birds is that they are such an easy way for anyone to connect with nature, even in the middle of a city.